I like having my curry with an egg and a vegetable dish at home. This is a Chinese style Preserved Radish Omelette that I served with my pineapple curry. 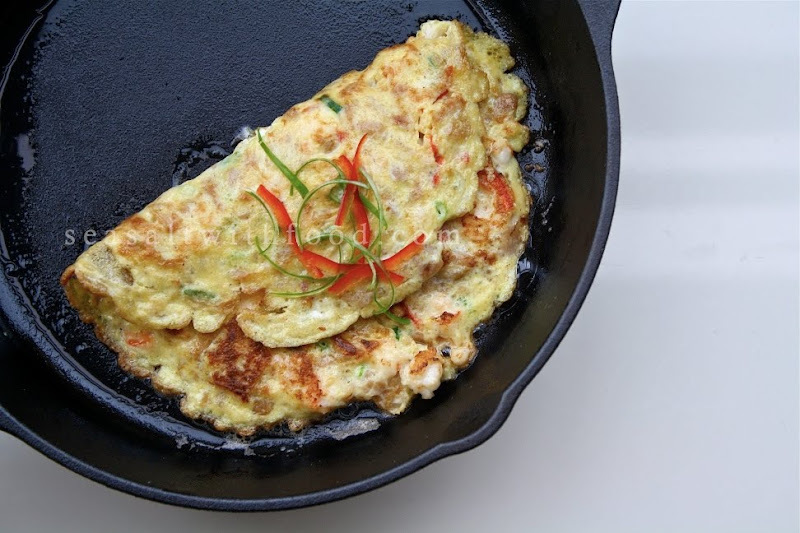 Preserved radish provides a good crunch to the omelette. If you are going to try to make this omelette, make sure you get the radish strips variety instead of the chopped up version. They are not as salty and taste much better. In a cast iron or a non-stick frying pan, heat 1 Tbsp of the oil on a moderate heat. Toss in the preserved radish and stir fry until fragrant. Then mix in the garlic and prawns and give it a quick stir. When the prawns turn pink, remove the mixture and set aside. 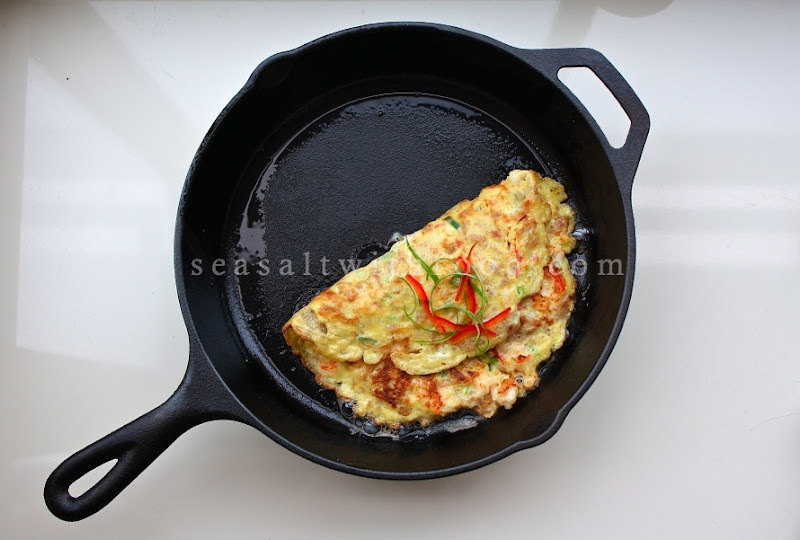 Beat the eggs together with prawn mixture, scallions, soy sauce, and season with white pepper and a pinch of sea salt. Heat the pan over medium to high heat, add ½ Tbsp of oil and pour in half of the egg mixture. When the egg has become lightly golden on the bottom, flip it over and cook the other side. Then continue to cook with the other half of the egg mixture. Serve immediately with some scallions and red chili, if desired. 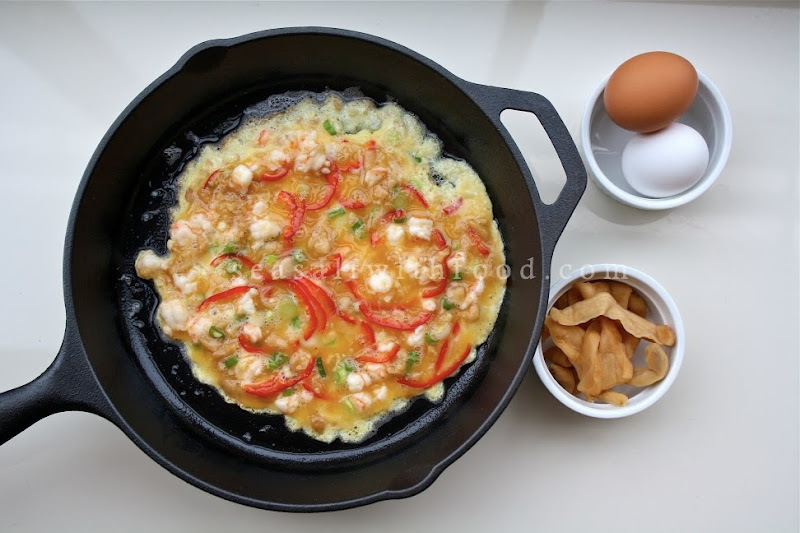 Chai poh egg - yum ... this is a great and simple dish. My hubby always orders this whenever we go for teochew porridge. @yours deliciously: Don't be homesick, try making your own..it's very easy dear. @Jo: I totally agree with you ! A great simple dish and tasty too.